The Americans has a high body count, but the major deaths are so few and far between that when a character is killed off, it still means something. Amador is stabbed in season one because he decides to play jilted lover with the wrong bespectacled D.C. resident, in turn becoming a bargaining chip that leads to Stan killing Vlad. Larrick and Jared are both dispatched in “Echo,” as season two bumps off the devil we knew—and the devil we didn’t. Mortality haunts season three more than its predecessors, but Annelise and Venter weigh heavy on Philip’s conscience, and Betty Turner demonstrates Elizabeth’s capacity for mercy. 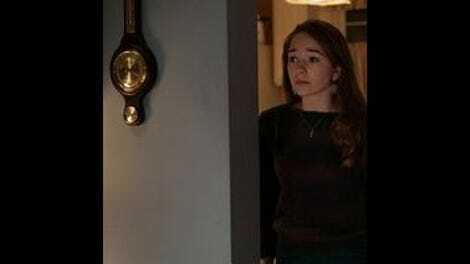 At a time when the two biggest shows on TV derive their narrative verve from the thought that any of the regulars could bite the big one at any moment, The Americans does not kill indiscriminately. Its main characters may have had all mechanisms for grief and mourning trained out of them (which is why the news of Elizabeth’s mother’s death doesn’t quite stick the landing in “Pastor Tim”), but they exist in a world where death still counts. And at the end of “Chloramphenicol,” death counts for a whole hell of a lot. I don’t believe Nina Sergeevna Krilova had any illusions about leaving Russia, though that belief was formed entirely by reading the tea leaves left behind by The Americans’ last three episodes. It would have to be: Annet Mahendru speaks, maybe, a grand total of five lines between “Experimental Prototype City Of Tommorow” and “Chloramphenicol,” and two of her scenes in these episodes are dream sequences. While Agent Aderholt is out to dinner with Martha (which may or may not be related to her apartment being raided by Stan), Martha mentions that there are “no false promises” in her romance with a “married man.” It’s the same with Nina’s time in the gulag: The show made no promises of escape to keep. There’s a hint of false promise in tonight’s dream sequence, but “Chloramphenicol” is quick to tip its hand. The heavenly light that illuminated the safe house last week creeps into the interrogation room and Anton’s laboratory, two spaces otherwise depicted as suffocating holes untouched by the sun. Such grand, romantic visions of freedom shall not come to pass in this world, something to keep in mind every time Matthew Rhys’ eyes light up at the thought of Philip, Elizabeth, and the kids going on the lam. From a cold, emotionless critical perspective, an execution is the logical endpoint of Nina’s story. The show’s visits with her have grown increasingly short, and returning her to a prison cell is a narrative cul de sac that no gorgeously lit dream can circumvent. As the story ends, so does her life. But that is not to say that her execution is devoid of feeling. I’ve been bracing for this development for weeks, and I still experienced a swell of sorrow, shock, and surprise when the gun went off. As The Americans proves time and time again, you never hear the bullet with your name on it. Nina is a character we’ve come to know and sympathize with, whose choices help determine the course of the show and whose relationships to other characters are complex and compelling. No other character who’s died on this show could be described in such terms. For these reasons and more, Nina’s death matters. One of those reasons: It’s a new, fatal wrinkle in the show’s concept of loyalty. Nina commits to many people, institutions, and causes, but none bring her deliverance. The dramatic irony of “Chloramphenicol” is that Oleg’s father re-ups his commitment to freeing Nina (after Oleg makes his own sort of loyalty pledge), but the machinery has already been set in motion. This is the thanks Nina gets for sacrificing her sense of self in the name of both the Soviet Union and the United States: A soldier in the Red Army shoots her in the back of the head. The hit on the clergyman and his wife is called off in the cold open—before Elizabeth contacts her daughter—defusing one of the episode’s biggest bombshells right off the top. “Chloramphenicol” is still plenty tense without it, though, with every cough from Elizabeth or Gabriel seeming like it could be their last (Elizabeth’s just having a bad reaction to the antibiotic), and Paige going toe-to-toe with Agent Beeman for the first time. That’s an exciting element of season four that hadn’t occurred to me in a while, and the episode plays it like Paige hasn’t been thinking along these lines, either: There’s that great pause after Stan asks about the Jennings’ last-minute change-of-travel-plans, as the camera shifts its focus from Stan to Paige, and Holly Taylor’s stunned silence replicates the audience’s own breathlessness. She comes up with a convincing cover story on the fly—her early adventures in Christianity already convinced us that this part of the family business comes naturally to her. Here’s how good “Chloramphenicol” is: In an episode that kills off a major character and traps the protagonists in a pressure-cooker quarantine, there’s still room for an expertly stitched together montage that marries a genre-hopping pop standard, a break-in, and a stunningly honest Martha monologue. This is the episode’s other great thriller moment: Like Paige’s exchange with Stan, the dinner chat between Martha and Aderholt is a progress report of sorts, the apprentices becoming the masters. Martha lays herself bare to one co-worker (with certain omissions) while the other finds a different version of the truth in her dresser. The song, the soliloquy, and the snooping intertwine in a fashion not unlike the Kama Sutra illustrations Stan thumbs through in Martha’s bedroom, interlocking in unexpected ways and intensifying the entire experience. Even the act of Martha and Aderholt biting into their hors d’oeuvres crackles with electricity! I want to watch that sequence on an infinite loop for purely aesthetic reasons, but it gets at one of the episode’s most important thematic points, too: In a lonely world, a little companionship goes a long way. Martha doesn’t mind Clark’s marital status (he’s married to another woman and a job) so long as she doesn’t wind up alone with the TV and the bottle of wine on Friday night. Later, William takes the personal and makes it professional, telling Philip “You don’t know what it’s like to do this job and not have anybody to talk to about it.” Sometimes a sympathetic ear is all it takes to get through the day. Or the thought that there’s somebody waiting for you on the other side of an antibiotic-fueled fever dream about your dead mom. Before “Chloramphenicol” gives way to Nina’s “Incident At Owl Creek Bridge” moment, it takes the Jennnings bowling (takes them bowling) in one of the most joyous scenes in Americans history. It’s not EPCOT, but it’s the next best thing: Unapologetically corny family funny in a period setting, all bopping along to Lene Lovich’s “Lucky Number.” (Key lyric: “The number one was dull and number two is best.”) Henry’s keeping score, mom’s rolling strikes, and Russell and Taylor strike an uncanny mother-daughter connection. It’s a welcome respite from what’s come before—and what will come after. Nina’s not as fortunate as Elizabeth. She dreams of walking out into the snowy wilds with Anton by her side, but wakes up without a cellmate. She dies surrounded by her countrymen, but she’s totally alone. As the bureaucrats sign off on the paper work, the only lingering reminder of Nina Sergeevna Krilova is the blood on the ground. She’s left her mark on The Americans: A red blot. How tragically appropriate. How appropriately tragic. In addition to killing it with that description of Martha’s relationship status, Alison Wright gets another great solo scene when she’s trying to fill Clark in on the Aderholt date without blowing their cover or incriminating herself in his nefarious doings. Her words are perfectly chosen, but Wright puts such an expertly measured sense of panic behind them. Aw geez, and then there’s Stan telling Henry about how he and Sandra met—damn, this episode is good. Between Stan remembering that Henry’s school crush teaches science and William picking up on Elizabeth’s parental anxiety (“I saw her face when she called home”), “Chloramphenicol” does some smart work with showing off the observational skills of its cast of spies. I am 99.9 percent certain that the bowling alley the Jennings visit was also featured in the “Philadelphia” episode of Broad City. Can anyone confirm? “I’m not as entertaining as TV, but there will be wine.” Don’t beat yourself up, Aderholt: Nobody is as entertaining as TV.